Okay fast food fans, here's a new project for you! 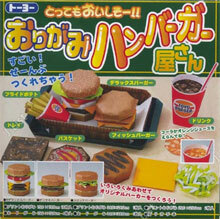 Make your own 'Burger Shop' tray of fast food out of paper! Decorative paper is supplied for you to fold your own meat patties, buns, lettuce, tomato and even fries. Flickr member marc0047 got the kit and posted photos of it and his finished product.